Both elegant and inviting, this classic pattern serves as a wonderful complement to casual and relaxed dining environments. Constructed of extra heavy weight 18/8 stainless steel, this serving fork also boasts a bright mirror polish, attractive rounded rimmed handle and four-tine design. The item measures 11 1/2" in length and will add a classic touch to any dining area. These forks are excellent and very durable. We own and bar and grill and they are perfect for our needs. We have used them for approxiamtely two years and will continue to order them. While long, the handle on this for stays skinny so that the whole thing does not become too heavy or bulky. Perfect fork for buffets. 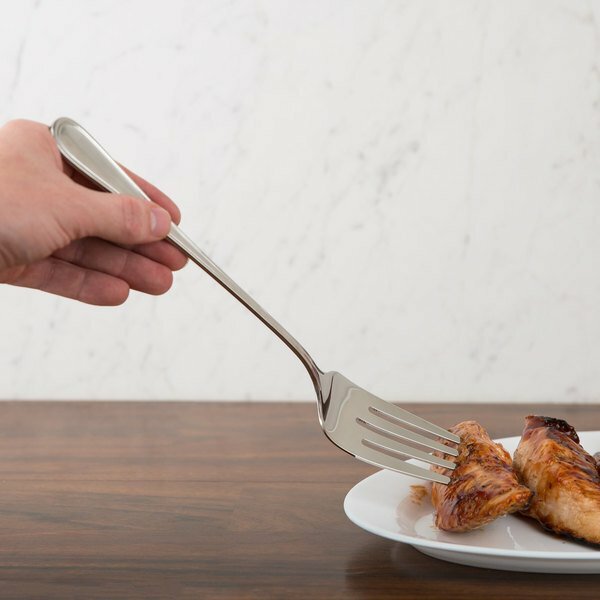 This is a great serving fork. Very solid, dishwasher safe and matched the other Regency items perfectly. The quality is very nice and it feels substantial. I am so impressed with this line of serving pieces I cannot say enough. The quality presentation size and portion control is beautiful. These 11 inch or‘s are the best in the market. By plenty you will use them . Great forks to use on a buffet, or for salads and pasta. These forks are good quality and I have purchased several more, the shine up nicely. I have the same design on flatware also. This is the longer sized serving fork that I got to match the other serving spoon of the same height. It’s elegant and classy. I’m happy of this addition to my culture set. I used it for serving ham--it looks awesome and matches my several other regency serving pieces. I absolutely recommend them to anyone that is looking to impress with their service. These Regency spoons are definitely a step up from the traditional buffet service wear that we were using before. It goes great with our Prima flatware. A very solid fork (definitely not going to bend on you) and has multiple uses. We use it for fluffing our rice once its done in the rice cooker. This is a large serving fork much more suitable for buffets than residential use or use as a carving fork. It is made of heavy duty 18/8 stainless steel and feels great in your hand, despite being quite long. The handle has a simple line imprinted around the outer edge, which I think looks good in both casual and more upscale environments. 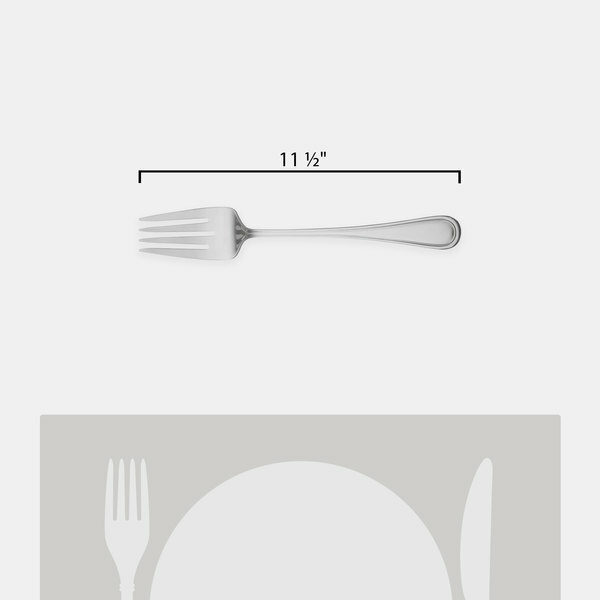 The Regency Flatware eleven and one-half inch stainless steel serving fork is the size is perfect for any buffet line or any time you need to serve large quantities. Besides salads, I have used it with heavier contents like brown sugar sliced ham I hope to see more serving utensils. Very durable and would recommend. 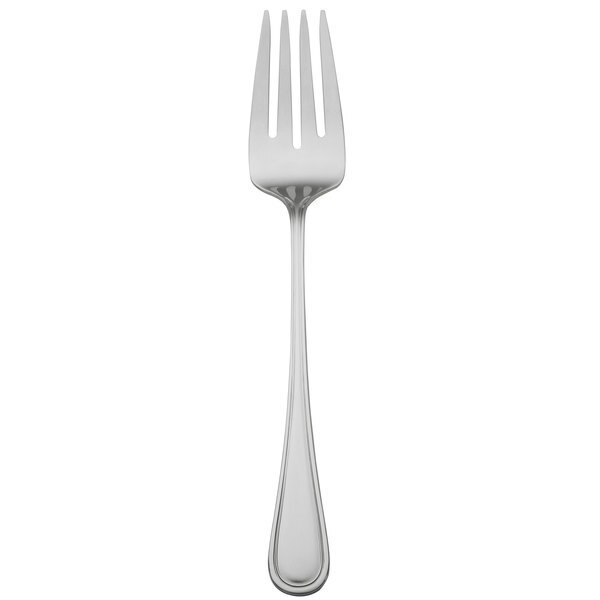 This is a great regency flatware stainless steel serving fork. It's pretty big measuring 11 1/2" in length. The fork part scoops a lot up at a time. 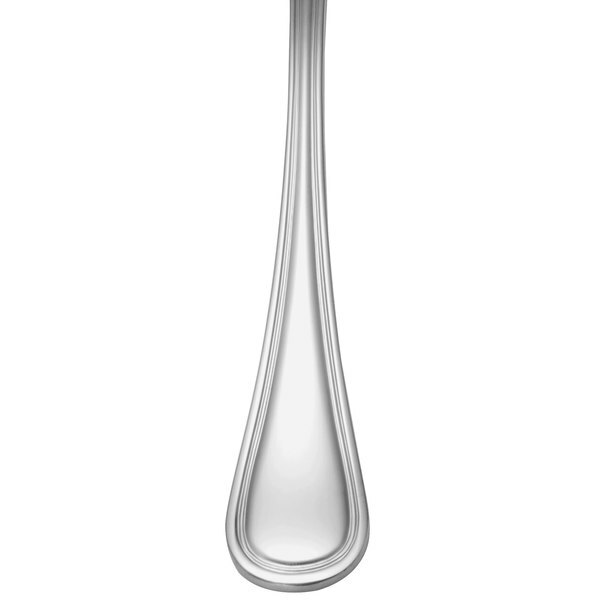 This serving fork is pretty fancy looking. I personally love the Regency brand because the quality and visual appeal are unsurpassed. It not only will do it's intended job but it will impress you guests as well. 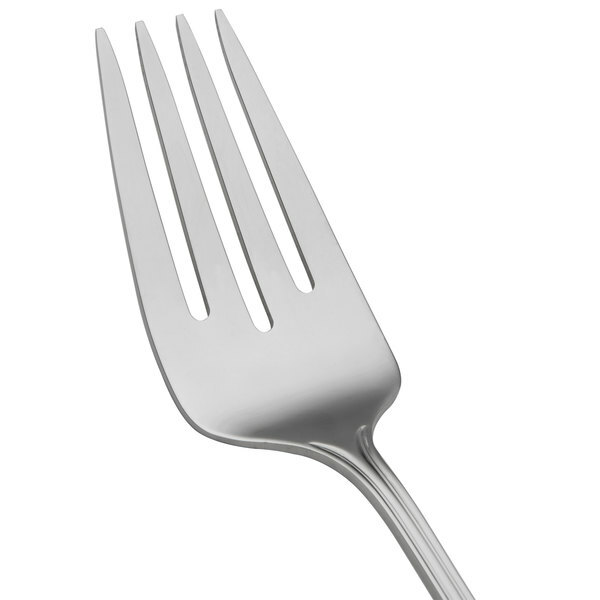 The review is based on the serving fork, but our catering business has the entire Regency lineup. Quality is great, finish durable & is a super visual asset to our service display. Rich hand-feel & classic styling turns a utility serving piece into something special. At a couple of bucks a throw, if one of them makes its way into the tear-down trash, it isn't going to be the end of the world. We buy these pieces by the dozen so as to have plenty of spares when we are doing a remote gig. These stainless steel forks look great on our table settings and are a very good quality! The price is very good in comparison to others as well!